The story that Queen Elizabeth, after seeing “Henry IV,” commanded Shakespeare to write a sequel showing Falstaff in love is probably apocryphal. All the same, “The Merry Wives of Windsor” was written, and it’s one of the Bard’s merriest romps, even if Sir John is depicted more in lust, and in avarice, than in love. The play has inspired two well-known operas, Verdi’s “Falstaff” and Otto Nicolai’s “Die lustigen Weiber von Windsor.” The adaptation with which Odyssey Opera opened its “British Invasion” festival of English musical dramas on Sunday at the Boston University Theatre is more obscure: Ralph Vaughan Williams’s “Sir John in Love.” But if Odyssey’s sweet-tempered production is typical of what the festival has in store, the Brits should take up residence. Vaughan Williams had the advantage of writing in the language of the original, and his opera, which premiered in 1929, sticks closer to Shakespeare’s text than do Verdi’s and Nicolai’s. For the arias and choruses, however, he mostly went elsewhere. Anne Page sings Thomas Middleton’s “Weep eyes, break heart”; Fenton wins that breaking heart with John Fletcher’s “Beauty clear and fair”; Mistress Ford croons “Greensleeves” while awaiting Falstaff’s arrival. The composer also drew on some folk tunes and dances, though most of the writing is his own typical bittersweet lyricism, with particular echoes of his “Pastoral Symphony.” The likes of Slender, Shallow, Sir Hugh, and Dr. Caius make cameo appearances, but the spotlight is on Fenton’s wooing of Anne, and Falstaff’s attempt on the virtue, and purse strings, of mistresses Ford and Page. Directed by Joshua Major, Odyssey’s is as good a production as you could hope to see. Stephen Dobay’s playful set recalls the one he created for Boston Midsummer Opera’s “Die lustigen Weiber von Windsor” two years ago. There’s a half-timbered façade with doors leading into the Ford and Page residences, a mantel with stags’ heads (and cuckolds’ horns) for the Garter Inn, a wooden palisade for Windsor, a massive tree trunk to represent Windsor Forest. Signposts tell you where each scene is set. There are no supertitles, which in any case would be difficult to create since much of the singing overlaps. 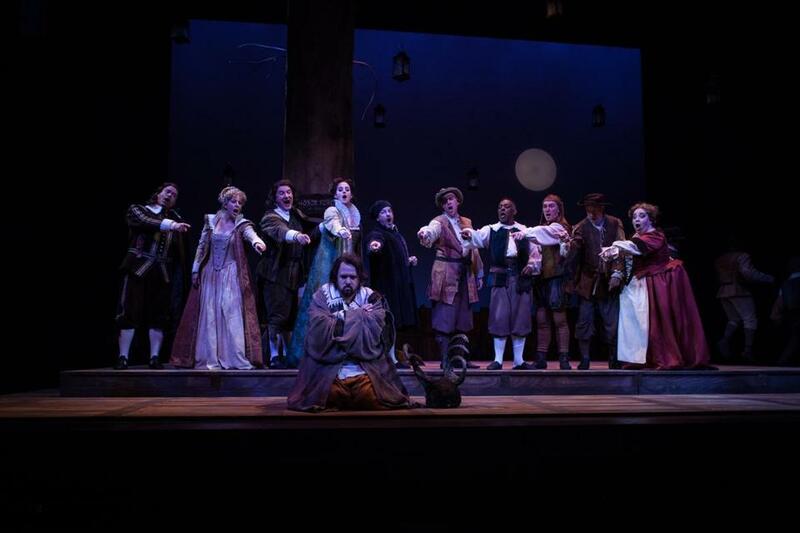 But at key moments — like the one when Mistress Page warns Mistress Ford and Falstaff that Ford is coming home — Gil Rose, Odyssey’s artistic director and conductor, keeps a tight rein on the orchestra. The singers enunciate with great care, and what they can’t convey with words, they do with body language. Seldom is opera in English so easy to follow. Or so much fun. Odyssey makes “Sir John” seem less like an opera than like an exquisitely acted play that happens to be sung. Oren Gradus realizes Vaughan Williams’s conception of Falstaff as a huggable rascal rather than an aging blowhard. Megan Pachecano is a teasing, determined Anne Page and not the typical meek ingénue; Samuel Levine is an ardent Fenton. Courtney Miller as Mistress Ford and Mara Bonde as Mistress Page make an engaging pair of conspirators; Michael Chioldi as Ford and George Cordes as Page are smart and sympathetic, and Chioldi is especially moving in his “Pardon me” plea. There are fine performances from Cindy Sadler as Mistress Quickly, Sumner Thompson as Dr. Caius, Robert Honeysucker as the Host of the Garter Inn, and the rest of the 23-member named cast, and the chorus, all boundless energy, is a joy throughout. Falstaff gets the last word, or rather, look, and it’s a look of love.